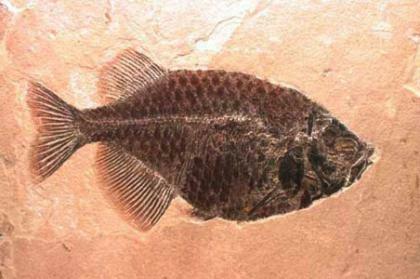 This is a 50-million-year-old fish (Phareodus) from the Green River Formation of Wyoming. This fossil is testament to a time when giant lakes covered large parts of Wyoming, Utah, and Colorado. The Science Museum of Minnesota's Paleontology Department has over 100 fossils of Green River fish, including some type specimens (specimens on which new species are based).